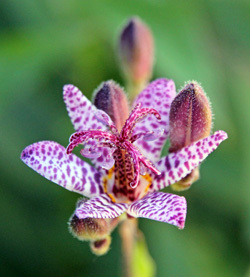 Hairy toad lily, Tricyrtis hirta, in bloom. The flowers of toad lilies look exotic almost like orchids. primarily for their orchid-like blossoms which open in fall after most other plants have finished blooming. But in the last two decades or so many new cultivars and hybrids were developed in Japan and the United States, including forms with variegated foliage and dwarf habits. 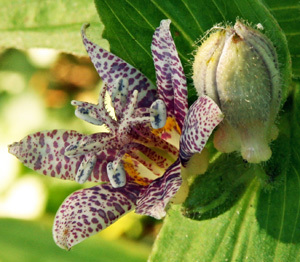 No longer a botanical curiosity, many Tricyrtis species are commonly available in garden centers and local nurseries, with even more offered by specialty nurseries. Tricyrtis hirta has attractive arched foliage. 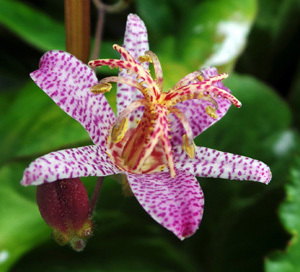 Hairy or Japanese toad lily, T. hirta (= T. japonica), is a species native to the Japanese islands of Honshu, Shikoku, and Kyushu that is commonly used for its interesting foliage and orchid-like blooms. In its native habitat it is found growing on shady rocky cliffs and steam banks. It is hardy to zone 4, whereas many of the other species offered as garden plants may not be hardy in Wisconsin. These are herbaceous perennials that emerge in late spring. 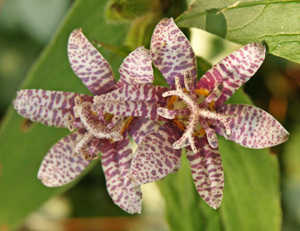 Hairy toad lily grows from creeping rhizomes, forming a clump of foliage that slowly expands over time. The alternate, clasping leaves are arranged in a ladder-like fashion along the stems. It is a highly variable plant that can reach a height of 12”-36”, emerging late in the spring. It produces arching, unbranched stems with alternate leaves all along the stems in a ladder-like arrangement. The 3-6 inch long, light green leaves are oval to oblong with parallel veins and clasping leaf bases. The stems often arch in the same direction, creating a graceful, flowing appearance. 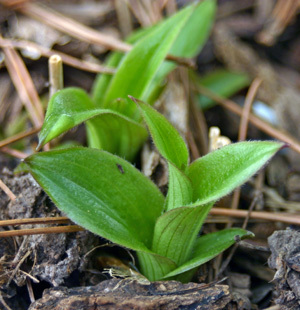 As its common name suggests, all parts of the plant are hairy. The styles and stamens form a crown above the flower. The showy tepals are often spotted with purple. prominent crown that extends beyond the perianth. The inch-wide, star-shaped flowers of T. hirta are white to pale purple with dark purple spots and a purple stigma. The flowers are produced singly or in small clusters of two to three in the upper leaf axils facing upwards. The flowers open in late summer to early fall, lasting for about three weeks or until a hard frost (both the leaves and flowers are damaged below 28 degrees F). The cylindrical seed capsules that follow the flowers eventually dry out and split open to release the small, papery disc-shaped seeds. The flowers are produced singly or in small groups in the leaf axils (L). The buds (LC) open gradually (C), and the prominent pouch-like nectaries are very visible at the base of the tepals (R). A bumblebee visits a flower of ‘Tojen’. Toad lilies are best planted where their small, unique flowers can be appreciated up close. They make subtle, but exotic-looking specimens for the edges of shady borders, woodland paths or in naturalized areas. 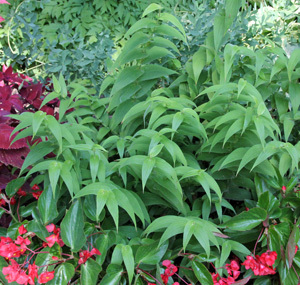 They are particularly effective in masses, but single plants make a good accent with other shade plants They combine well with other perennials that also like moist, shady conditions, including anemone, astilbe, ferns, hellebores, hostas, lungwort (Pulmonaria), and trout lilies (Eythronium spp.). 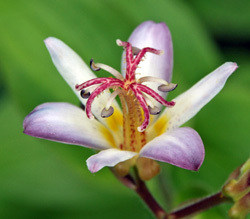 Hairy toad lily can be grown in containers and the cut stems used in fresh flower arrangements. Bees and other insects will visit the flowers. Grow toad lilies in part to full shade. Grow toad lilies in part to full shade and moist soil rich in organic matter. 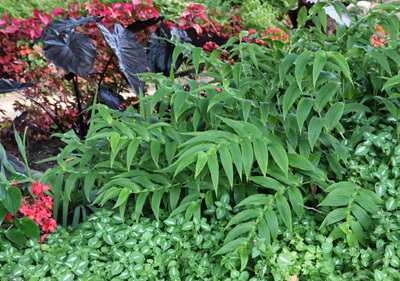 This plant tolerates sun in cool climates as long as it is kept moist. With insufficient moisture leaves will become spotted and brown along the edges and plants may go dormant prematurely and not bloom in drought conditions. 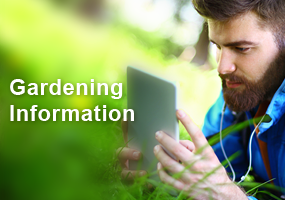 Plants will grow taller in moist soils, and remain shorter in drier conditions. If possible, site them in a sheltered location to protect the late-blooming flowers from early frosts. 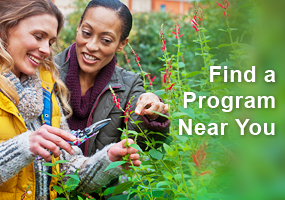 Plants can be covered during light frosts to protect the flowers and prolong bloom. 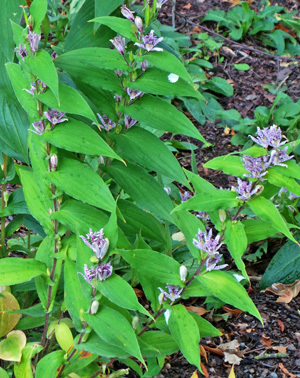 Many of the toad lilies will self-seed and naturalize in ideal growing conditions. 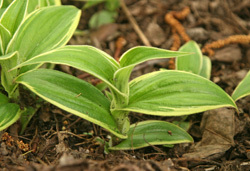 Toad lilies have few pest problems, although rabbits may eat them. 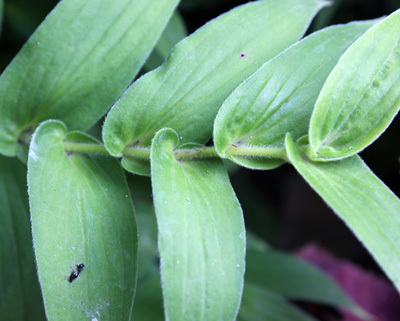 Hairy toad lily has few pest problems, although slugs may damage the young growth and rabbits may eat the leaves and flower buds. Deer, however, do not prefer this plant. The fungal disease anthracnose leaf spot can affect some cultivars, but can be managed by increasing air circulation around the plants, minimizing overhead irrigation and removing fallen and symptomatic leaves to reduce the amount of spores in the leaf litter surrounding the plants. An aphid-borne mosaic virus that produces irregular spots and flower coloration occurs, but apparently little is known about it at this time. ‘Alba’ or ‘Albescens’ – is not a single clone, but includes any seed-grown, white-flowered plant, so the vigor and flower quality can vary considerably, with some having pure white flowers while others are actually marked with pale green spots. Plants sometimes develop open crowns due to lax or fallen stems. 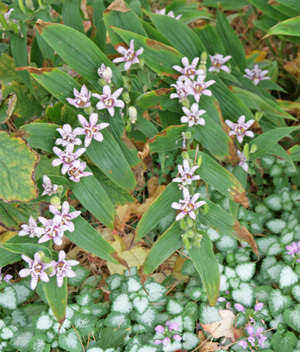 ‘Albomarginata’ – is a strongly variegated cultivar with leaves edged in creamy white on 18” arching branches and purple flowers in early fall. ‘Golden Gleam’ is a short (18”) cultivar from Terra Nova Nurseries with chartreuse foliage spotted with large grey dots. The leaf axils are tightly packed with dark purple and white-speckled flowers in fall. ‘Lightning Strike’ – is a Japanese selection with bright golden foliage variably streaked with green and light lavender flowers on the 2 foot tall arching stems in early fall. ‘Minazuki’ is a more stable form of this cultivar. ‘Miyazaki’ – a seed strain selected for its shorter, gracefully arching habit. With good moisture it is very florific, opening its numerous purple and white spotted flowers almost all at once in late summer and early fall. 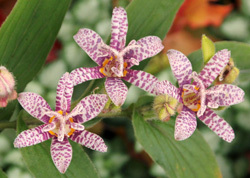 It has been the most successful of the toad lilies grown at Rotary Botanical Gardens in Janesville, WI, where the profusion of flowers really stand out in the garden. And it was given an excellent rating in a 10-year research trial at the Chicago Botanic Garden (zone 5b) because of its superior floral display, robust habit, winter hardiness and disease resistance. This cultivar had the best floral show of the 24 types studied in that trial, with more than 80% of the flowers open at once. ‘Miyazaki Gold’ is a smaller (only 12” tall), variegated form with pronounced, soft yellow edges on the leaves. ‘Moonlight’ – is an all-gold (often with tiny green lines) sport of ‘Variegata’ with purple flecked white flowers that grows 15-20” high. ‘Raspberry Mousse’ – is a newer cultivar from Holland with dark red-purple blotches (which may actually be virus induced). ‘Sinonome’ – is a hybrid of T. hirta and T. formosana that forms a large, upright clump and terminal clusters of purple and white speckled flowers. It is hardy to zone 5 and is generally not affected by anthracnose. ‘Tojen’ (sometimes spelled ‘Togen’) – this robust hybrid between T. hirta and T. formossana (sometimes labeled T. stolonifera), produces terminal clusters of interesting flowers: the outer tepals are white with lavender margins and the inner tepals are clear white, without spotting. 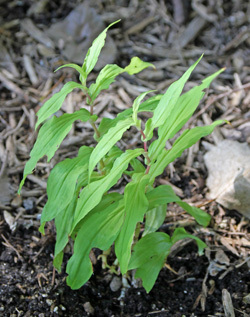 It is a tall plant with relatively large, bright green leaves on burgundy stems. It is hardy to zone 5, is resistant to anthracnose, and does not reseed. Foliage of ‘Variegata’ emerging in spring. ‘Variegata’ – has lavender flowers and creamy edges on the leaves that fade to light green by the end of the summer. ‘White Towers’ has white flowers (L) and spotted leaves (R). ‘White Towers’ – a more upright, vigorous selection of T. hirta (but often listed as T. latifolia or as a hybrid) with spots on the leaves when young. 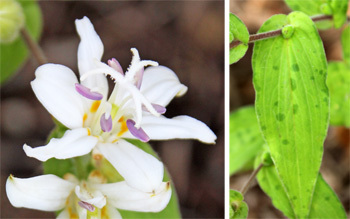 It has pure white flowers in the upper leaf axils and terminals that bloom earlier than most other toad lilies. The species can be grown from seed (although they may not come true if other plants are in the area, as species can cross), while the cultivars have to be propagated by division in early spring when still dormant or from cuttings taken in late spring through early summer before the flower buds develop. These root readily from the nodes, even in just water. 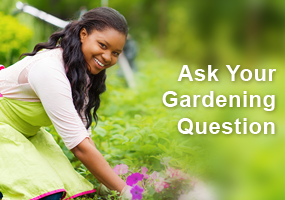 Seed should be sown fresh or will require moist stratification for three months. 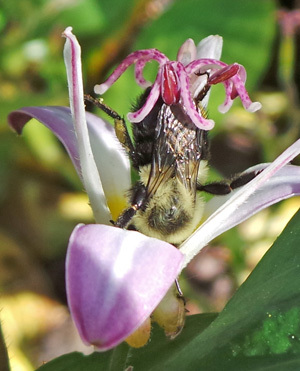 Interesting article…will consider toad Lilly for a shady spot I have—always looking for something that will bloom in shade. Especially like that it blooms s not later in season than many other perennials. Excellent source of information. Thank you.